When it comes to delivering exposition, it is no surprise that games struggle. Michael Abbott points out on his blog here that delivering backstory to an audience has always, like so many other things, been an exercise in trial-and-error. We’ve struggled with this problem for centuries in the theater. Sophocles used a Chorus to fill us in. Shakespeare relied on characters like the bloody captain in Macbeth, whose sole function was to describe…events that occurred offstage. In drawing-room comedies the ‘butler on the phone’ technique conveniently delivered who/what/where/when to the audience within minutes of the curtain rising. a problem of both conception and execution. Narrative games self-limit their facility for storytelling, partly because we relentlessly cling to recycled power fantasy tropes; and partly because we so often restrict our imaginations to interchangeable protagonists. If I might build upon this, I’d argue that, put simply, the narrative in games has been allowed to suffer at the expense of more important things. Characters and protagonists have been reduced and cheapened into male-centric archetypes because budgets are high and tight, the audience is predominately male, and frankly, story in games just doesn’t much matter. It is decorative, it is flair, it is supplementary to the mechanics. It is true that John Marston is a shockingly rich character, and the people of Rapture help develop the city into a character all its own, and the character-centric structure of Mass Effect 2 fosters a certain camaraderie in one’s squadmates that isn’t often seen. 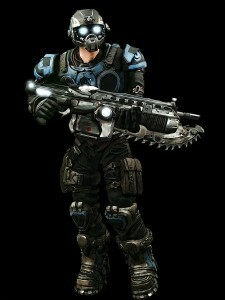 But these characters supplement the gameplay, and without gameplay and you’ve got an interactive movie. Heavy Rain is the notable entry in this regard, but succumbs to the faults of swinging too far the other way: Heavy Rain is defined nearly as much by its story-first emphasis as it is by clunky controls and tired quicktime events. Abbott punctuates his thoughts with the old axiom on writing: “show, don’t tell.” This, indeed, is the prompt which designers and writers ought to follow to find a nice happy medium between gameplay and exposition. But as he discourages designers from burdening players with bad writing, I repurpose the discussion from delivery of backstory to game design itself. Far too often players are told what to do and told how things work in place of allowing players to make guided discoveries on their own. I was reminded by a presentation by a pair of my peers before setting off to find an already published example of what I mean. @Skilltacular and @SteveEmber gave a talk in grad school regarding, among other things, level design in Super Mario Bros. For a game that essentially resurrected the American video game market, this pair began with what struck me as a shockingly simple example of effective show-don’t-tell design philosophy: the player’s very first interaction with Mario. See the placement of Mario on screen and the direction he is facing. Why isn’t he standing in the middle of the screen? Why isn’t he facing left? Mario stands off-set to the left, facing right, to encourage the player to explore to the right. This may sound shockingly simple, and it should. Though scrolling screen designs have been around since Defender, the side-scrolling platformer was not. When sitting down with Mario, players new and old had to learn how Mario and his game worked. Rather than tell the player to move to the right, Miyamoto and his team provided an unobtrusive hint in the positioning of Mario. Perhaps unsurprisingly, the first published article I could find along this vein revolved around another of Miyamoto’s games. Creative Lead of Incubator Games Radek Koncewicz beautifully dissects the level design of Super Mario Bros. 3, World 1, on his blog here. If you’ve never considered or scrutinized level design before, and even if you have, this is a fantastic analysis—an eye-opening look into the world of proper design (in fact, stop reading and check that out now!). The game doesn’t have any forced hand-holding, and it isn’t afraid of the player simply exploring it at his own pace (even if it means circumventing chunks of the experience). This approach also serves to encourage multiple replays, and — back during SMB 3′s initial release — it probably sparked many playground discussions. I don’t need to go over all his insights (I encourage you to do that), but I will point out that 99% of the time when a new mechanic is introduced or a secret is to be had, the design of the level hints or encourages the player to discover it without consciously thinking. It’s truly transcendent in design, and certainly not something seen too often today. As with the original Super Mario Bros., the “?” Blocks are encountered as soon as the game begins. Since they utilize a fairly universal symbol for a question, they inherently invite the player to investigate. 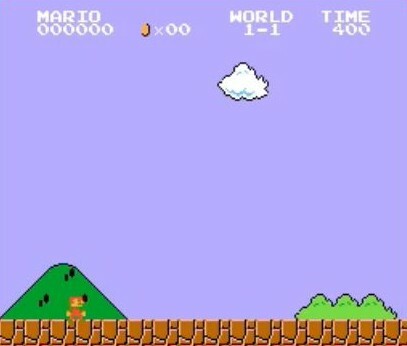 In addition to being positioned over Mario’s head, a slowly approaching Goomba encourages the player to jump up and discover that hitting the blocks from below can yield rewards (in this case, some Coins and a Super Mushroom). It’s the combination of the symbol used for the block, the Goomba, and the placement of the two (possibly even the rounded shape of the enemy) which encourages the player to hit the block from below while avoiding (or landing atop) the Goomba. In this instance, an unknowing player will have been hinted to move right (Mario is positioned in the same position as he was in the previous example), and they will have been taught how to interact with the question mark block and this enemy type, all without intrusion, without the player consciously thinking too hard, and all in the matter of about three or four seconds. It’s a bit more eloquent than tool tips, pop-ups, and tutorials. The one point I took issue with was 19, though Koncewicz makes a case and I’d add that by nature of the non-flammable enemy design and the thrill of flinging fireballs together intrigue and foreshadow future use and experimentation. With each example Koncewicz offers, the player is shown how to play through delicately guided design. He admits that the player retains free will to make choices against the grain—potentially missing chunks of the experience—but doing so requires the player to consciously think against the design of the game, which itself is so carefully constructed along a certain logical flow. Super Mario Bros. 3 illustrates this show-don’t-tell philosophy quintessentially. Features and functionality are revealed to the player much more naturally and unobtrusively than any tutorial or pop-up could. The player is not led through the game by the hand—explained everything and repeatedly removed or distracted—but is allowed to interact with Mario and just play. And with show-don’t-tell design, playing is the only tutorial a player will ever need. Previous: DC Universe: A Review…. Of Justice! Next: F.3.A.R. – Share The Terror! Nice article Josh. You had some solid points. Keep 'em coming. Also, its nice to know someone was listening well enough to mention our talk nearly a year later.